5 years ago last week my grandmother passed away. She battled breast cancer on 3 separate occasions and it eventually claimed her life. This weekend also happened to be Mother's day, I couldn't think of a better week to celebrate my grandmother's life. She was an avid reader, quilter and an amazing friend. She made everyone feel like they were the most special, important person. At a luncheon after her funeral, I was talking with several of my cousins, and we all commented, that each of us thought we were her favorite. Turns out we all were. The last time we ran in this, in 2004, my grandma greeted us at the finish line. 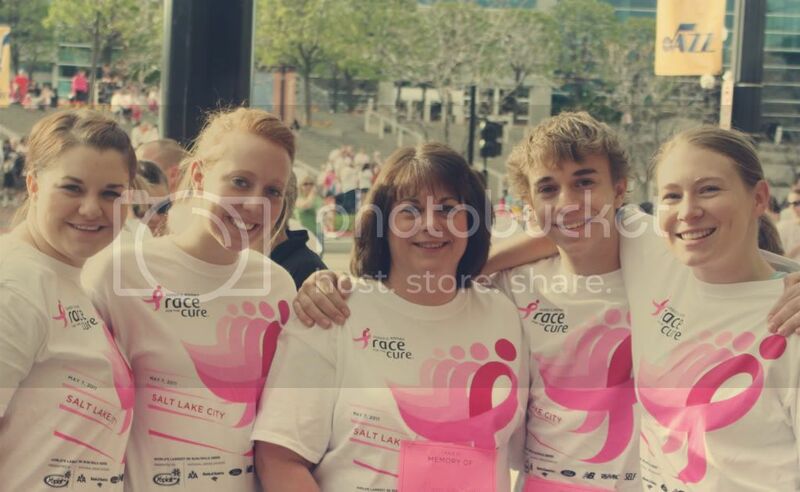 This time, we all wore pink signs saying, "In memory of Grandma Baker." We had 11 of her direct descendants participate on Saturday. It was a great way to celebrate her life and her legacy. I'm proud to support cancer research and I'm so grateful for the doctors who've treated my mom and all our other family members who have been affected by cancer. After the race, we all gathered here at my parent's house and had a big luncheon. We were joined by the other family members that were unable to attend the race. I think we had about 30+ people in our house. Lots of food, laughing and stories about Grandma B. It's amazing how much one person can touch so many people.